The lawyer representing Lethbridge Pro-Life says nothing short of free speech is at stake during a judicial review which will come before the Alberta Court of Queen’s Bench this fall after the City of Lethbridge rejected five pro-life ads LPL applied to post on Lethbridge Transit. “I do see that, increasingly, government thinks it can take sides on an issue and decide to support one side and not the other, when the law requires that government stays neutral and protects the individual’s right to free speech, no matter if it’s controversial,” said Carol Crosson, a constitutional lawyer representing Lethbridge Pro-Life. The judicial review set for Oct. 10 in the southern Alberta city is the culmination of a three-year saga. In the fall of 2016, Lethbridge Pro-Life applied to post an ad, featuring a photo of a healthy baby in utero and the words “Preborn babies feel pain. Say no to abortion,” on city transit property. After over a year, the city approved the ad in January 2018 and posted it in on transit buses, benches and shelters a month later. At that time, the City communicated no further concerns about the ad, Crosson said. In April 2018, the City of Lethbridge posted on its website that it had received more than 100 responses to the ad, most of which were complaints. Crosson said Lethbridge Pro-Life later found out two Lethbridge residents had started the complaints and worked with an Alberta pro-choice group and the Abortion Rights Coalition of Canada to have the ads pulled. 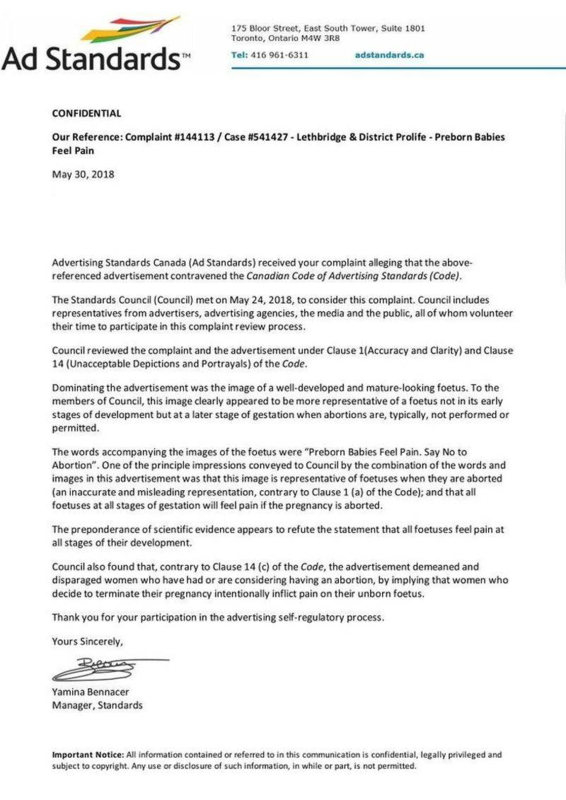 Crosson called it a “typical response” from Advertising Standards Canada to pro-life ads, with little relevance to Lethbridge Pro-Life’s litigation against the City of Lethbridge. Also in April, two Lethbridge residents started two separate petitions defending Lethbridge Pro-Life’s right to free speech. Crosson said at last count, the two petitions had more than 3,000 signatures between them. In fall of 2018, Lethbridge Pro-Life submitted five different ads to the City of Lethbridge for consideration which had the tag line “Say no to abortion” and the LPL logo. “These are some of the most innocuous pro-life ads I’ve ever seen,” Crosson said. All were refused. “That’s one of the most sinister reasons government can give for refusing expression, which is ‘Individuals have complained about your prior expression, so we won’t protect your expression now,’ ” Crosson explained. Crosson said LPL is alleging bias in its application for a judicial review. A spokesperson for the City of Lethbridge, Carly Kleisinger, declined to comment since the matter is before the courts. Crosson said one of the reasons the city gave was that the ads were inaccurate. One of the ads, for example, had a tagline that stated that human rights shouldn’t depend on where you are. However, she said that the content of the ads is clearly opinion, and the accuracy of opinion is impossible to determine. If the application for judicial review is denied, LPL has the option of appealing the decision to the Alberta Court of Appeal.